The main use we’re looking at is “social viewing” — where an in-world audience can watch live video on a screen at a specific location, simultaneously, giving them the opportunity to discuss the shared experience via chat. This is hard to replicate on the web: You can’t synchronize the viewing of YouTube videos with friends, for example, and even if you do all watch a live video clip — say a Steve Jobs keynote presentation — then there are still no easy ways to open a back-channel for commenting with like-minded strangers; if you use Skype, you only get your buddies. In Second Life, by contrast, everyone who is interested in a presentation just shows up at the appointed time and place. It’s a wonderful example of spatial navigation as an expression of interest — just as we do it in the real world. With this technology, we plan to show lectures and Swedish short films, teach Swedish lessons, broadcast live Swedish jazz and DJ sessions — all we need is a laptop, a video camera, a microphone, a broadband connection, and Wirecast, a really cool live video editing tool (for Mac and Windows) that lets you create and send a very slick-looking video stream to a streaming server. The whole system works flawlessly, and it lets us repurpose our content: An open session by the Nordic Council of Ministers, for example, might be broadcast to Second Life, a web page, and mobile phones. 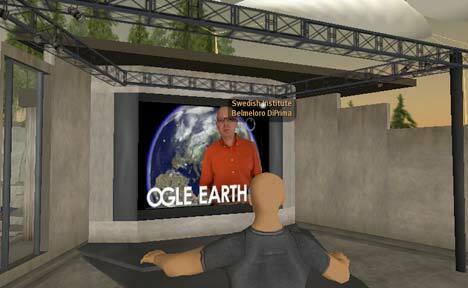 Only in Second Life do you get to engage in social viewing, though. In other situations, such as when a the director of a short film attends the Second Life screening to provide running commentary and takes questions from the audience, there is not much point in putting the video stream on the web — all the added value occurs in Second Life. All of this was done live, in one go, with me controlling both Wirecast and Google Earth from my laptop. A less stressful setup would be for somebody else to control Wirecast while the talking head just concentrates on talking. If I had used a proper colored background for the chroma key, better lighting, a real DV camera and microphone (instead of what’s built into my MacBook Pro) then the result would have been much crisper. Also, Desktop Presenter can send screencasts to Wirecast from other computers on the LAN, so you could have Google Earth running on a second computer, for example, which would share the load. Alternatively, you could have a second monitor off the edge of the background screen, so that would-be meteorologists really can convincingly pretend to stare at what’s behind them. If you’re a schoolteacher, having students make their own broadcasts like this could be a wonderful way to get them interested in meteorology or geography. If you’re doing outreach for anything that involves a geospatial component (science, human rights, environmentalism), this would be a great way to show what you’re about to people who may not be familiar with KML, Google Earth or even computers. There’s just one catch: cost. Wirecast isn’t cheap — $450, though there is a free demo — and if you want to send live video to more than a few recipients, you’ll need a special webhosting service that can run Quicktime Streaming Server (or the open-source equivalent). 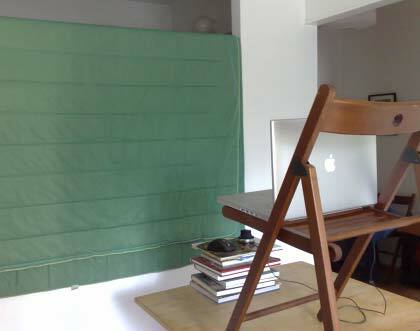 But if you’re a school and you want to use Wirecast for class projects, then the price certainly becomes reasonable. Isn’t this kind of redistribution of GE content not allowed by Google’s license? You might want to check with your lawyer before doing any more work. If Google has given him their blessing. Then all is good. Have you tried the SIOX based, forground extraction tool (E-Chalk) instead of green screen? Stefan, check out the demonstrations I just posted to add to the discussion on this. Hopefully you’ll be able to explore the controller I’m proposing. Thanks a bunch, Stefan. This is the perfect solution for a project I’m working on. A very interesting display of statistical and geographic data, as well as a compelling story.